The force under General Jones's command was much smaller than Wainwright's North Luzon Force. It consisted primarily of the 1st Infantry of the 1st Division (PA) and the inadequately trained and poorly equipped 51st Division (PA), which had for its artillery component only one battalion of eight British 75's. The 42d Infantry, 41st Division (PA), was assigned to beach defense on the west side of the island. The rest of the division had gone with General Parker to Bataan. Artillery support for the South Luzon Force was provided by the three batteries of 155-mm. GPF's of the 86th Field Artillery, defending the beaches in southwest Luzon, and three batteries of 75-mm. guns (SPM) organized into the 2d Provisional Group.4 Armored support was limited to one company-Company C of the 194th Tank Battalion-detached from the parent organization with the North Luzon Force. The Japanese force in south Luzon was numerically smaller than the composite American and Philippine force defending the area. Drawn from the 16th Division and led by the division commander, Lt. Gen. Susumu Morioka, it consisted of the 20th Infantry, the 16th Reconnaissance Regiment, and supporting arms and services. General Morioka's route to the Philippine capital was not as broad or as smooth as that followed by General Tsuchibashi in the north. The Japanese in northern Luzon had the wide central plain to traverse; the path of the 16th Division was blocked by mountains and broad lakes. (Map 7) Immediately after landing at Lamon Bay, Morioka had crossed the steep Tayabas Mountains with the major part of his force. Before him were the towering heights of Mt. Banahao. To reach Manila he would have to skirt the southern slopes of this obstacle and follow Route 1 westward. Once beyond Mt. Banahao he could turn north toward the huge inland lake called Laguna de Bay, follow Route 1 along its western shore, thence through the narrow corridor between the lake and Manila Bay into the city of Manila itself. The smaller force which had landed at Mauban would have to skirt the northern foothills of Mt. Banahao, move along the south shore of Laguna de Bay to Route 1, then northward to the capital city. The two enemy forces would have to act independently until they were halfway to Manila. ately went forward to stop the retreat. Meanwhile, the Japanese reached Sampaloc, which they took without opposition. From there they pushed on toward the barrio of Piis, four miles distant. On his return to the 1st Infantry lines late that night General Jones ordered Major Rumbold to fight a delaying action until he was forced to withdraw. He was to retire northwest along Route 23 to a point above Luisiana and hold there until further notice. Meanwhile, Colonel Tsunehiro had been advancing along the Mauban road. When he reached the road junction where the 1st Infantry and the Scouts were dug in, he was met by determined resistance. For several hours there was a hard fight; finally at about 1400 the defenders were forced to pull out and fall back along Route 23 toward Luisiana to the northwest. The Japanese did not follow immediately but continued southwest to Lucban, only a short distance away, which they reached at dusk. about noon of the 28th while the column to the west occupied Majayjay at about the same time. The Japanese advance in two columns constituted a real threat to the 1st Infantry. If the element to the west pushed on rapidly it might reach the south shore of Laguna de Bay before the Philippine regulars and cut their line of retreat. The 1st Infantry, therefore, at 1000 on 28 December, began to fall back to Calauan on Route 2 which paralleled the south shore of Laguna de Bay. Withdrawal to Calauan meant a circuitous march of twenty-five miles, first north and northwest along Route 23 to Santa Cruz, then southwest along Route 21. The regiment began its march at 1000 on 28 December, but before it could reach its destination and set up defensive positions it was directed to proceed to Los Banos, seven miles farther along Route 21. From Los Banos it was a short distance to Route 1, the main road northward to Manila.11 The 3d Battalion of the 1st Infantry, stationed originally to the north, pulled back at the same time to Pililla on the north shore of the lake, where it was in position to halt an enemy advance to Manila from that direction. 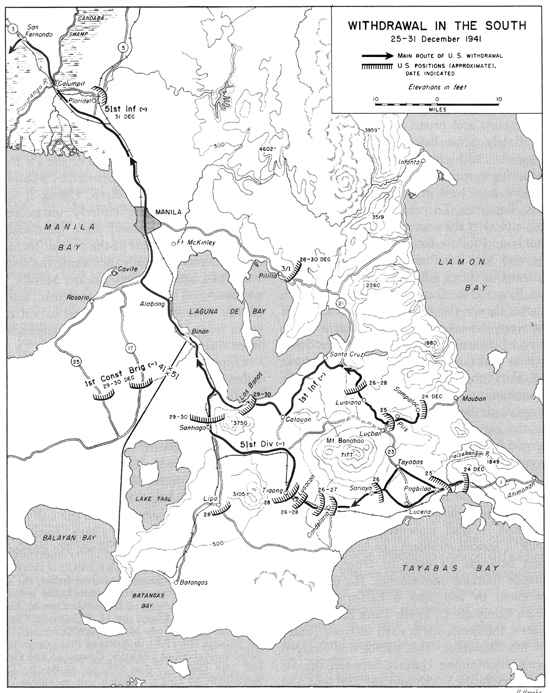 By 29 December the 1st Infantry, forming the north flank of the South Luzon Force, had withdrawn successfully from Mauban on Lamon Bay to Los Banos along the south shore of Laguna de Bay, a distance of thirty-five miles. It was now in position to move quickly around the lake and northward past Manila through San Fernando, thence to Bataan. to Tiaong, where it turns north toward Manila. Tayabas and Lucena are linked by the southern portion of Route 23. The road net between Pagbilao and Sariaya is shaped like a kite, with its tail (Route 1) stretching eastward to Atimonan. Before Pagbilao, flowing due south, is the Palsabangon River, intersecting Route 1 about 3,000 yards east of the village. On Christmas Day Colonel Cordero's 52d Infantry was ordered to hold the Pagbilao-Tayabas road, and Colonel Boatwright's one battalion of the 53d was posted on the east shore of the Palsabangon River to cover the east-west road and Cordero's line of retreat. When the Japanese reached the river they were halted briefly by Boatwright's 53d Infantry troops to permit final preparations for the demolition of the bridge and the crossing of Cordero's men. The last 52d Infantry troops crossed under enemy fire and the bridge was blown almost in the face of the pursuing Japanese. Colonel Cordero continued through the 53d Infantry lines to positions about 2,000 yards northwest of Pagbilao, along the Tayabas road. Boatwright remained at the river line to oppose the expected Japanese crossing. The Japanese were held up only briefly at the Palsabangon River. During the afternoon, they forced a crossing and established a bridgehead on the west bank of the river. Colonel Boatwright's battalion withdrew quickly along Route 1 through Pagbilao. The Japanese who had forced the crossing, the 16th Reconnaissance Regiment, reinforced, did not pursue Boatwright but turned northwest toward Tayabas instead to follow Cordero's 52d Infantry. The pursuit of the 53d Infantry along Route 1 fell to the 3d Battalion, 20th Infantry, which had crossed the Palsabangon behind the 16th Reconnaissance. By evening of the 25th the Japanese were in possession of Pagbilao and in full pursuit of the two American columns withdrawing rapidly toward Tayabas and Lucena. The Japanese were too close for comfort. To cover the retirement of the 52d and 53d Infantry, General Jones hurriedly made new dispositions the next day. He pulled back the 3d Battalion, 53d Infantry, from its position on beach defense along Tayabas Bay and attached it to the provisional infantry battalion formed earlier from the 51st Field Artillery (less two batteries). This unit, led by Col. Hamilton F. Searight, Jones further strengthened by attaching a platoon of Company C, 194th Tank Battalion. He then ordered Searight to dig in along Route 1 at the eastern edge of Sariaya and to hold there until the troops of the two infantry regiments moving back from Tayabas and Lucena passed through his lines. important network of roads, and was in position to drive west along Route 1 or north on Route 23. At 1900 on 26 December General Jones established his foward command post at Candelaria, seven miles west of Sariaya, on Route 1. Here he organized his first line of defense. Along the two rivers which bracketed the town on the east and west, Jones posted Colonel Boatwright's 53d Infantry (less 3d Battalion). The main line of resistance was established along the river west of the city, with an outpost line on the river to the east. The bridges over both rivers were prepared for destruction. At the same time, General Jones set up a secondary line six miles behind Candelaria, at Lusacan, with Colonel Cordero's 52d Infantry. Troops of the 53d Infantry would fall back through Cordero's line when they withdrew from Candelaria. With two lines across the enemy's route of advance, Jones pulled Searight back from Sariaya to Tiaong, about 3,000 yards west of Lusacan, where Route 1 turns north toward Laguna de Bay. Searight broke contact with the enemy at 0100 on the 27th, his troops moving to the rear in buses. CAMOUFLAGED 155-MM. 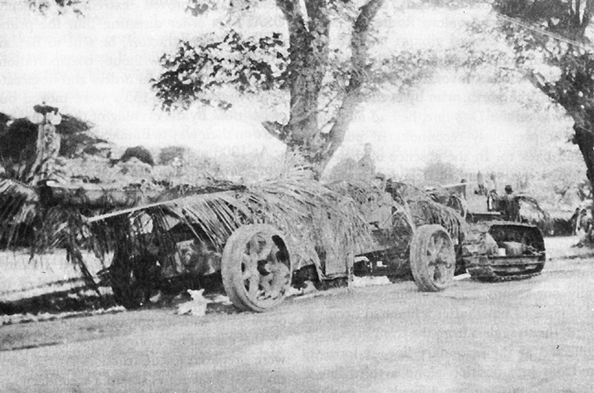 GUN M1917 (GPF), towed by a 10-ton tractor. The Japanese did not stop at Candelaria. Pushing ahead aggressively, they reached Lusacan, six miles away, on the morning of the 28th. Here they ran into Colonel Cordero's 52d Infantry, deployed along the secondary line of defense. The Japanese were able to outflank Cordero's position quickly and at 0915 the American commander abandoned his position and retired toward Tiaong. that he would make a determined effort to hold here. In the line he placed about four battalions of infantry, a battery of field artillery, and all his tanks and self-propelled artillery. The SPM's were deployed so as to provide direct support for the infantry, and the eight guns of the 51st Artillery were placed on high ground to the left of the main defenses, enfilading the path of the Japanese advance. 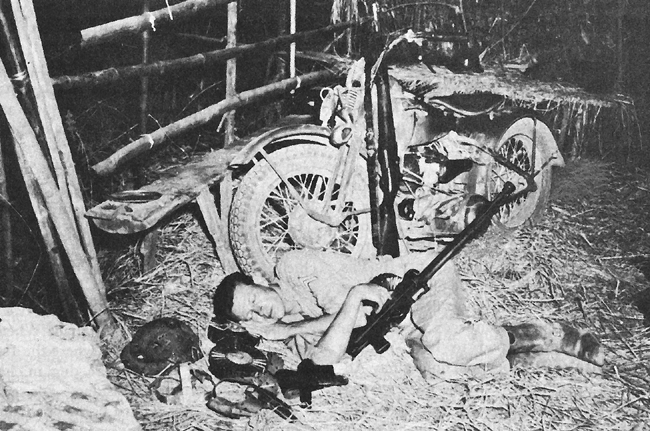 To secure the rear, Jones withdrew the Philippine Scout detachment under Major McKee from the 1st Infantry and placed it in position about eight miles north of Tiaong. The 51st Infantry (less 1st Battalion) was placed at Lipa, eleven miles to the west, in position to cover the approaches from that direction. The 2d Philippine Constabulary Regiment, part of the 1st Constabulary Brigade, was in general reserve. From Santiago, about six miles southwest of Los Banos, it could support either the Tiaong position or the troops along the lake. Despite these elaborate preparations no stand was made at Tiaong. By the evening of the 28th General MacArthur had apparently become apprehensive about the right flank of Wainwright's North Luzon Force which was now on the D-4 line. He therefore ordered General Jones to hurry his withdrawal and to get out of South Luzon in time to pass safely behind Wainwright's lines. The entire South Luzon Force was to be across the Calumpit bridges by 0600 of the first day of the new year. By evening of 29 December the South Luzon Force stood in position at Santiago, with flank guards at Los Banos and on Routes 17 and 25, and a mobile reserve at Alabang to the north. Approximately half of the 51st Division was already on its way to Bataan. The rest of the South Luzon Force was ready to follow. To the south the van of the Japanese forces, the 16th Reconnaissance Regiment, was just entering Tiaong. of additional equipment to Bataan and Corregidor. Jones, unaware of the situation to the north, was puzzled by the new order, coming as it did but thirty-six hours after the order calling for a top-speed withdrawal. But without question and happy for an opportunity to meet the enemy, he immediately made his plans. He went forward to Santiago where the bulk of his force was and arranged an ambush. The position was an excellent one, the force adequate, and time sufficient to prepare the trap. Except for a few patrols, the Japanese were still around Tiaong and Candelaria, consolidating and moving up equipment and supplies, the last of which had been landed about noon of the 28th. Those elements advancing were doing so slowly and cautiously. General Jones arrived in Plaridel a short time later. After a brief search he found his new command post just before daylight. He immediately phoned MacDonald and instructed him to close the command post at McKinley. Captain Christensen went forward with a North Luzon Force staff officer to learn the exact location of troops in the area. By the last day of the year most of Luzon was in the hands of the enemy, but General MacArthur's forces were still intact. The first part of the double retrograde movement to Bataan had been successfully accomplished, and the USAFFE commander could report to Washington that "the South Luzon Force had made firm contact with the North Luzon Force in the San Fernando area. "27 All that now remained to complete the withdrawal of the troops east of the Pampanga River was the difficult maneuver across that river and the movement north through San Fernando then south into Bataan, while the troops along the D-5 line fell back along the roads leading into Bataan. It would be a hazardous operation, for enemy air and ground forces were an ever-growing menace as the area of maneuver became smaller. But the greatest test, the complicated movement of thousands of men and tons of supplies from north and south Luzon toward San Fernando, had gone well. The success of the withdrawal would be decided during the next few days.